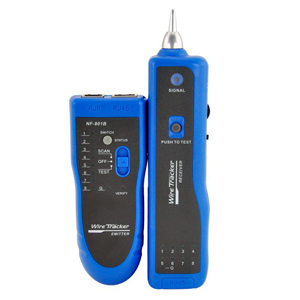 NF801B wire tracker is a MUST item for telephone and LAN installers. With NF801B you can easily find target wire in a bunch of cables on net bar or on router. Indicator beeper has volume control, and included earphone is handy when working in noisy environment. NF801B also works as a cable tester. It can test continuity of RJ11 and RJ45 wires. Two 9V batteries and carry case are included. 1. Quickly trace and identify cables among lots of unknown cables. 2. Check continuity of Lan cables. 3. 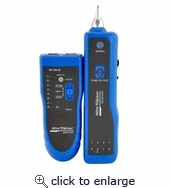 Track the cables or wires, and diagnose the breakage. 4. Visible indication: pin-to-pin cable map for individual cable (not by pairs). 5. Low Voltage alarm function. 6. Earphones permit use in noisy environments. 7. LED light assists use in dark corners.